I need to get a lift in order to get under the various vehicles I now have to maintain for myself and my mother (and bury the not-to-code and ridiculously dangerous grease pit my dad installed many years ago). In watching all the various car shows, it seems the two-post variety is the most popular, but the drive-on four-post might be the most convenient (except when you need to remove the wheels, obviously, or raise one of the tractors). 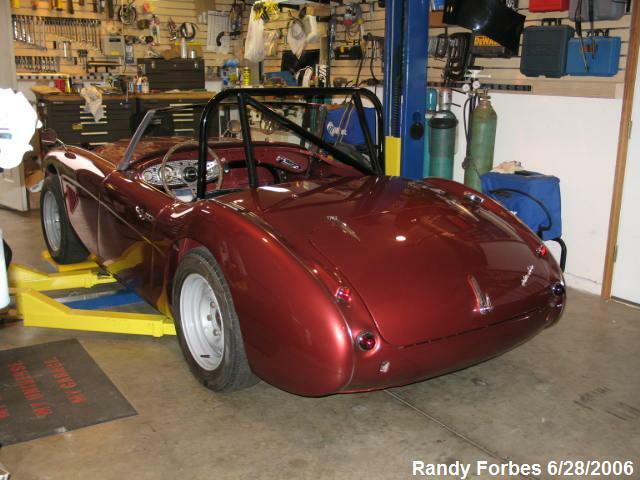 So, I'm leaning toward the 2-post--any and all suggestions on brand (American-made preferred) and size accepted--but I'm concerned about supporting a Big Healey at four points on their famously flimsy chassis rails. What are you all using? Any issues lifting a Healey by the chassis (assuming it's not fully swiss-cheesed)? EDIT: So, in perusing the 'net for available lifts, it occurred to me that a 2-post may not work with a Healey's exhaust hanging so low; is it possible to get a 2-post's arms under the exhaust on the left-hand side? I do not own a lift yet, however when I researched lifts a while back, I considered a 4-post a better choice for my needs, which included vehicle storage, one above the other. Not sure about the 2-post lifts, but the 4-post lift did not require anchoring to the garage floor, plus there are accessories such as drip pans and hydraulic jacks for raising the vehicle off the wheels. The brand I was considering was Backyard Buddy. Backyard Buddy looks good--Made in the USA--but their website curiously emphasizes their use for car storage; is there something limiting WRT to getting under the car and doing work? I installed a two-post Atlas unit in the shop/garage I built about 5 years ago. Very happy with it, I went with this brand because they have a warehouse locally and I could save the frieght and just w/c it. Installed very easy and has all the spacers to clear the Healey exhaust. I use it primarily for the maintenance of my vintage racer and not car storage. I needed to be able to service the wheels, brake, suspension, etc directly and didn't think a four post would allow this, plus a four post would have taken up too much space for me. How do the spacers help clear the exhaust (I can't see in your photos)? Very timely thread for me! I have been looking at the MaxJax two post portable lift. www.maxjaxusa.com This one can be removed and installed again so you can have some space back! It will fit in my spacious but low ceiling shop and accommodate my three sports cars, the BJ8 being one of them. There are a few electrical and concrete requirements but you can download the installation manual from their site to see if it works for you. I plan on ordering one in the near future. Not sure where on the Healey those lift pads go but I know others with Healeys are using this setup! Cheers! Thanks, Scot. Looks like these only lift up to 4' though (with adapters). I'd like something I can walk under. Bob, I am sold on a 2-post. I really don't think the cost is prohibitive. I bought a 10k lb. Danmar Lift. It is a clone to a Benpax which is very popular around here in many commercial garages. The Danmar was a little cheaper. When i bought it it was about $2400. Two points I would like to make, well maybe 3, I bought a "clear floor" type meaning the connecting cable and bar is at the top. This leaves the floor clear, for 2 reasons to me. One is if you ever have to push a dead car into the lift bay you do not have to push it over the floor plate. Another reason is that if you are moving an oil catch tank under the car, or a transmission jack you do not have floor obstruction from the floor plate. This is very important if you think about it. A floor plate can be very annoying if not ridiculously in the wrong place at the wrong time. Another point is that I bought one that has rubber pads at the ends of the arms. Don't buy one with the metal flip up brackets as with low cars they may be impossible to deploy. My arms have a max low height of 4 1/2". I think that is as low as you will get them. They will go under the Healey with no trouble but because of the muffler depending how where you position the car, I have to use pad extenders to make sure the arm clears the muffler. You can see that situation in my picture. One manufacturer offers a pad that screws into and out of the arm for height adjustment. I almost bought that but I was concerned about its strength considering that I also lift heavier vehicles as well, such as a Land Rover, Ford Expedition, etc. But it may not be a concern, that is a personal decision. From my research I remember that to have these things certified by one of the "Authorities" and I forget which authorities they are, but they have to pass a test where they lift and hold for a certain period of time the amount of 1 1/2 times their rated capacity. One last point, in all the research I did before I bought one, I never realized that a "standard width" lift is not wide enough. With Danmar and many of the others ( they do obviously give their width spec) they offer what is called an extra wide option. I found out after I installed the standard width that I cannot put some cars on it because it is not wide enough. The angle brace on the arm hits the body of some vehicles before the arm swings under far enough. I can just barely get my C5 Vette on it, and I can not get some newer Vettes on it that have the wider body features. But if I jack up both ends and then swing the arms under and block up the pads then I can do it. This keeps the bodies away from the arms braces. So don't buy a "Standard Width", get the "Extra Wide". See pic. By the way, I usually put the pads on the frame just behind the engine mounts and as far back as the rear wheel will allow. If that frame holds it while is is going down the road, it will hold it on the lift. I have a four poster drive on . I use it for storage and working on . You need minimum 9ft ceilings and if you have an up and over regular garage door with chain type pull opener then its not going to work . In my old garage I had to have the tracks for the door modified to make the door open closer to the ceiling and go with a direct drive opener . No such issues in my new shop as it has 13ft ceilings but I still went with direct drive opener to keep things cleaner looking . My hoist is 220 volt the 110 volt ones are way to slow to lift . Make sure you have your power outlet installed in the ceiling to keep the power cord to the pump out of the way . Look for a deal where they include a bridge jack and drip trays and if you go with drive on make sure you get aluminum ramps ...your back will thank you . BTW my hoist isnt bolted to the floor , I put some rubber matting in between the steel plates and the concrete and it stops it “walking” as you raise n lower cars . This is a narrow width lift to accommodate my narrower track Bugeye and Spitfire. The BJ7 fits with no problems. I bought three of the drip trays and the jack bridges so I can do brake/tire work as well. Also bought the caster set for moving the lift. The casters work somewhat OK, but I only tried moving the lift with the Bugeye about two feet off the ground. No clue why the one picture is upside down! Thanks for all the input, guys. Not surprisingly, the opinions were pretty much evenly split since both 2- and 4-post have advantages. I'm leaning towards a 4-post, since most of the work will be oil changes, bleeding brakes, etc. But, I think I'll spring for (at least) one of the scissor jacks for when I do need to do suspension work. Of course, I'll need an oil drain and some other toys/accessories. Looks like a nice shop Bob. It's a lot more cluttered now, unfortunately. When I moved, I stored a bunch of our stuff in there. Dad was a bit of a hoarder--we still have parts for Model As we sold decades ago--and I have to get rid of a couple old player pianos Dad wanted to restore. Since we're on a farm, everything gets a coat of dust on it. But I'm not complaining. We have a 4 post lift from Gregg Equipment. It accommodates our modern car as well as the Healey and a ‘50 Didge truck. It it does require a higher ceiling height. And it serves as a dinner table. Bob, I'm a big fan for the 2-post type, because I am always working on the cars, mostly customer's M Coupes & Rdstrs, but I can occasionally squeeze in some work on one of my own cars (THAT is going to change pretty soon, as I wind down working for others...). On the left side, I use the body outriggers, but with a couple small blocks of wood so that I'm not lifting on the body-panel's flanges. On the RH side, the arms can reach farther inboard and the pads, while still under the outriggers, are adjacent to the maim frame rails. 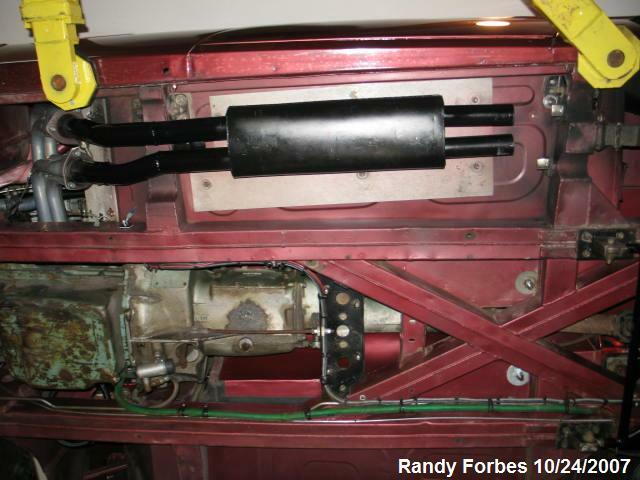 This picture shows the Healey on my old "floorplate" lift (equalizing cables/hydraulic hose pass across floor) essentially the same as Dougie's, except mine is branded by Eagle (Chinese manufacture with American cylinders & pump unit). Looks like in this shot, I was relying primarily on the sills (they're solid, I replaced inner/outer & rockers myself) while fitting an exhaust system. Since you have the ceiling height, I highly recommend the 2-post with overhead cables/hose (typically 12' minimum ceiling reqd.). Since moving to Florida, I put this Bend-Pak ( https://www.bendpak.com/car-lifts/tw...ifts/xpr-10as/ ) which is likely one of the least expensive ALI Certified lifts on the market, at least it was 6-7 yrs ago when I was doing my research. Another old picture taken in Ohio. For those of you with vertically challenged garages, note the tops of the columns poking slightly into the space between ceiling joists; these were eventually finished off with 1' x 3" trim frames. Note too the plastic drop-cloth so another car can be parked under The British One for the night without getting marked with oil drops! Geez .... You guys were supposed to make it EASIER to pick a lift I was all but sold on 4-post but Randy, as usual, makes a good case for the 2-post. I guess I'll just have to keep pondering (of course, buying one of each would solve the problem, but it's a bit more dosh than I want to spend right now). I have a scissor lift that raises to 6’. It works very well and no posts in the middle of the garage. But if I had your room, I would go with the 2 post. 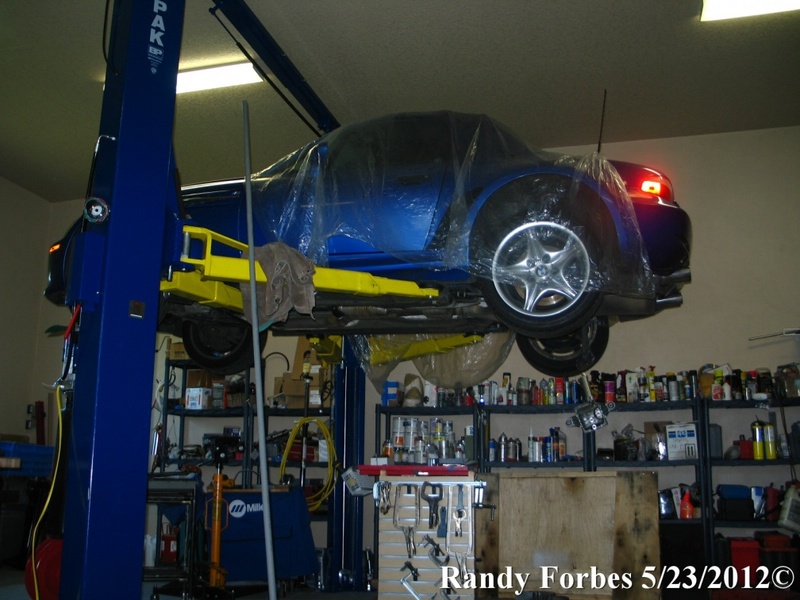 I've been using 4 post lifts for years, and work on several Corvettes on a regular basis. I've used a jacking bridge and a 2-bag air bag jack when I need to work on wheels or suspension. I also have an aluminum floor jack from Harbor Freight that I can easily lift up onto the Lift if I need to jack up a vehicle from the side. You can work around the "down" sides of a 4 post, but you can't use a post for storage. I think the big decider is if you plan on using the lift for storage of cars . Personally I would not store any car on a two post lift with all the suspension components hanging . A four poster is perfect for storage and working on cars and as to Randys comment about leaning over into an engine bay . Make a small standing platform to put alongside the car to give you a little more height to lean over . Problem solved . I also have a good quality office type chair on wheels so can happily scoot around under the car so Im not standing for long periods . You cant do that as easy with that bridge plate hump on the floor that two posters have . An important consideration for a two post lift with a Healey is the reach of the arms. A full-size lift may not be able to reach far enough to get to the best lift points. Because of height limitatios i have a MaxJax and had to position the posts closer together for the Healey and Jag than for my daily drivers.